In healthcare there is unlimited demand but limited, shared resources. Hospitals, physicians, pharmaceutical, medical technology and home care companies can demand everything from us in return for just a few years more without pain or even a few months more with our loved ones. The stakes are high but right now, across healthcare systems, there are huge miss-aligned incentives resulting in reduced patient outcomes and supply chain inefficiencies. The irony is that we ourselves are the principal root causes of these inefficiencies. Living for today and avoiding discussions about cost of healthcare are the root of these misalignments and is an approach perpetuated across the whole system. The 'tragedy of the commons' has been suggested as a paradigm for the current state of Western healthcare systems, wherein if patients, providers, and funders continue to pursue only their own self interest in consuming common healthcare resources, the combined effect will ultimately lead to catastrophic system failure. In this scenario, there are several 'social and individual traps' found in healthcare, where decision makers don't co-operate with each other and are reactive and poorly informed. Last year, the commonwealth fund reported that the UK has the best value healthcare system in the world where, until recently, 95% was publicly funded and many held sacred the idea of 'healthcare being available free at the point of need'. However, there are clear challenges faced in the UK healthcare system today. Despite the amazing efforts of healthcare professionals on a day-to-day basis, these challenges indicate that we are perilously close to a tragedy of the commons scenario, and that the system is in fact bad value and becoming hazardous. There are misallocated resources and waste at every level of the supply chain. Society as a whole is not moving quickly enough to address the crisis that healthcare faces. The age related burden is compounded by the increasing percentage of deaths that come from preventable long-term disease based in unhealthy lifestyle choices. The problem is that, as consumers, we are not taking responsibility to change this, nor are we given incentives by the system to do so. Information on cost and outcomes is limited and consumers do not understand or compare value between healthcare options or providers. The result is that healthcare is over utilised and taken for granted, the personal responsibilities of prevention and funding are being avoided until it's too late. Policy makers and funders also take a relatively short-term view driven by political or financial cycles and an aversion to remodelling funding structures or discussing cost increases. A longer term view of healthcare provision would mean that their conditions of funding and payment, could drive a focus upon outcomes as well as cost, but they too are incentivised to perpetuate a system which has a bias towards short-term, reactive treatments, rather than being led by prevention and outcomes. Funders also work with poor information sources on comparative costs and outcomes and as a result struggle to make best value judgements. Providers (including primary care commissioners, hospitals and physicians, as well as pharmaceutical and medtech companies) are therefore driven to a short-term reimbursement for volume model and to seek the optimal case / product mix by matching 'funded demand' with scarce supply. The focus is often a distributive approach which sees each provider compete for their share of the pie and 'game' against each other, rather than; co-operate, integrate and create long-term value. Information on costs and outcomes is not captured or disseminated well across the system and as a result consumer, funder and provider information are all undermined. The root of healthcare supply chain inefficiencies can often be traced back to these issues being echoed in day-day activities. It follows, therefore, that one might see how better co-operation, incentive structures and information flows are a principal route to improved supply chain efficiency and outcomes. The architecture of the system, its supply chain is surely therefore a discipline which merits increased focus and investment. The irony is that this very discipline is the one that is lowest in the current decision making hierarchy. Often it is other specialities; financial, service management or clinical, which specify the services and all too often the procurement and commercial perspectives take second place. Procurement need to add-value by driving synergy between the design of care pathways and end-end, integrated supply chain management. In addition to direct spend, which accounts for approximately 70% of a providers spend (goods and services where the demand can be attributed directly to particular care pathways) or indirect (where the demand is more volatile and driven by other factors e.g. age of equipment, estates and facilities, PFI), appropriate points of aggregation either at a pathway, speciality or organisational level need to be identified and their impact upon care pathway resource allocation understood. There are some indications that this is beginning to happen in the UK healthcare supply chain. Compound benefits would result from integrated supply chains with aligned incentives and information in care pathways which cover multiple settings, from primary through secondary, tertiary and community care (see here for an example in Orthopaedics). Only recently have commissioning procurement professional found themselves becoming more involved in the specification of care pathways and in managing the resulting contracts. At a recent Healthcare Supply Chain Association (HCSA) conference, there were the first signs of primary care commissioners taking responsibility for the provider supply chain in new ways. Although funding and reimbursement regimes may be the slowest part of the system to change, a primary care commissioner still has an opportunity to do something immediately. They can take a long term strategic view of healthcare provision which provides incentives for improved service integration across community, primary and secondary care, or they can maintain a short term focus with fragmented provision. They can choose to drive open book cost and demand transparency amongst providers, or perpetuate a lack of transparency. They can choose to incorporate outcome measurement and innovation as part of the contract performance. Each one of these choices will lead to either better integrated care provision in their region or more fragmented. There is, however, still a gulf between primary, community and secondary care providers which offers the opportunity of procurement taking the lead in overcoming the natural orientation of each to focus only on their own interests. In the absence of an aligned incentive structure with primary care, hospitals game to optimise reimbursement, and often find themselves driven by incentives that lead to over-treatment and a preference for higher cost (margin) treatments. Clinicians have fractious relationships with administrative disciplines but close relationships with pharmaceutical and medical technology companies. As a result the roles of service and product specification have often become divorced from price and cost discussions, resulting in miss-allocated resources and waste. Across the NHS as financial constraints begin to bite, relationships are beginning to change and pressure is growing on procurement to drive value across the entirety of the hospitals non-pay spend (roughly 30% of revenue), especially in the most complex, high value supply chains. 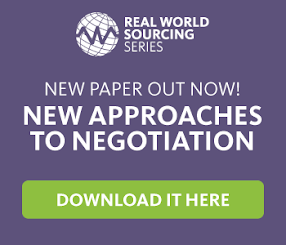 In some areas, procurement professionals are beginning to find new models to collaborate with each other in order to better aggregate and manage demand. More and more, product and service specification decisions are being made with clinicians, finance and procurement working cohesively together and with better cost and financial impact information. There is increasing investment in tools that enable cost and outcome data capture and analysis. The next step would seem to be even more effective collaboration between providers on higher value add procurement categories with improved compliance and supplier performance management and which includes regular financial and quality (outcome) based evaluation. In the largest specialities (e.g. Cardiology, Orthopaedics, Gastroenterology) there is also an emerging extended collaborative model, which would result in even more transformative cooperation and restructuring of the incentives and information flows along high value care pathways where; community care, commissioners and key suppliers around the table too. As in the 'tragedy of the commons' paradigm, healthcare systems are on the brink of collapse where there are low levels of co-operation, misaligned incentives and inadequate information. These problems lie at the heart of massive healthcare supply chain inefficiencies and can begin to be resolved by co-operating to align incentive structures and improve information flows at every tier of the supply chain. With non-pay spend accounting for 30-35% of the entire healthcare budget, procurement should have an important role alongside clinicians, service managers and finance in transforming service architecture and care pathways, to drive better value and outcomes from the governance, incentives and penalties of commercial performance management. They should also avail themselves with the influence, skills and tools to manage complex healthcare supply chain relationships and deliver innovative sources of value. The next article 'Super co-operators' will focus upon relationship management in healthcare supply chains not only with stakeholders and other providers but also upstream with primary care commissioners and with key suppliers. If co-operation would lead to such benefits, how can procurement professionals manage such a complex, wide spread number of relationships?